I drive a Subaru Forester. You can put two babies in it. No one has ever remarked on it other than to point out they have the exact same boring, perfectly reasonable vehicle. It was a surprise, then, when people were excited to see me in a Fiat 500X. With children, there’s a rather large gap between what looks fun and actually is fun. The bright plastic bear with the flashing hands that speaks Mandarin? Boring. The plain box filled with suffocating plastics it came in? Peter Travers couldn’t hyperbolize the joy it brings a small child. This was on my mind when a Fiat 500X initially bound for Mike Ballaban, who was offered a Ford Raptor around the same time and for some reason chose that instead, arrived at my house. It’s a little more expensive than my anonymous silver Forester, but it’s the same basic formula: A taller version of a roughly car-sized vehicle with AWD and a hatch out back. The Fiat 500X was designed to look like the regular Fiat 500, a smart move when you consider the 500L was apparently designed to look like a copy-and-paste error. My Subaru Forester was designed–if it was designed at all–to look like an efficient hauler of people and their objects, which it mostly is. My goal, then, was to determine if the tradeoff in “fun” as a driver would outweigh the kind of “fun” one enjoys as a parent: Getting in and out of places without a lot of hassle. Just sitting in my driveway, the Fiat 500X is a lot more fun. 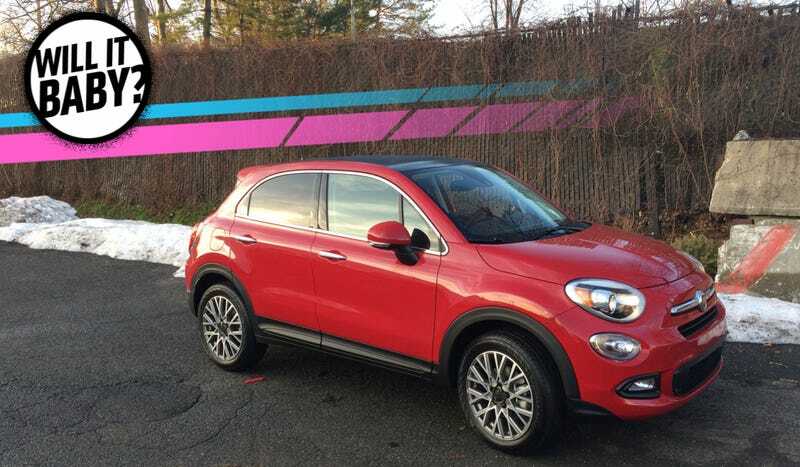 It’s not clear how Fiat managed to morph the two-door 500 into a four-door crossover, but there’s something charming about the goofy 500X’s wide grin and its open-spoke wheels. It’s the adult version of a Huffy bicycle. Inside the vibe is classic Italian in that it’s about as subtle as a dead horse in your bed. You like the color red? We’ve got the color red! The dash is held together with a giant swath of shiny red plastic and the seats are fairly comfortable brown leather. The effect is impressive. Clifford the big red Fiat. PhotoL Author. The Forester’s interior palette is comprised primarily of of blacks and slightly lighter blacks. Whereas my Subaru offers a lot of interior space, the rounded greenhouse of the Fiat means less room for passengers and this results in a slightly claustrophobic feel. Fiat smartly addressed this by installing a dual sunroof similar to the one offered on the platform-mate Jeep Renegade, but without the removable panels. My daughter Bette had a good time peering out through here own little window in the roof. As for actually babying, it took a while to get the Chicco Nextfit convertible seat we use to fit snuggly when secured using the LATCH connectors. I think this was because the seats had a little more give than the firm ones in my Subaru. The carseat eventually fit, though it didn’t leave a ton of room for the passenger in the front (in my case, a container of used motor oil). In back, the 500X has enough room for a large stroller, a regular-sized bag, and maybe a few other items. Trunk space is probably the biggest concession this car makes and, while it’s better than a regular Fiat 500, it’s just barely passable. Like a limousine when you’re 16, the concept of being in the car is the greatest draw and any other experiences you’re hoping you’re going to have don’t quite pan out. In everyday driving the Fiat 500X is efficient and quiet and quickly forgettable in the way most modern cars are. Turn the dial to “Sport” mode and it’s “sportier” in the sense that it’s worse. The nine-speed auto shifts like there’s a drunk person in the transmission. The 2.4-liter naturally-aspirated four has a reasonable 180 horsepower and yet never feels fast. The steering wheel feels nice and thick when grasped, and it may or may not be connected to the rubber wheels on each corner of the car via a series of rubber bands and paperclips. Even for an AWD car it tends heavily towards understeer and loses traction abruptly. That’s not my idea of fun. My idea of fun is not having to think about editing what I bring when I travel. My idea of fun is taking the money I saved by not spending $31,720 for a little crossover with leather trimmed bucket seats, 18-inch wheels, terrible Beats audio system, and annoyingly beepy safety features and instead spending that money on a used car I can wrench on. I limited pushing the 500X in Sport Mode to when Bette wasn’t in the car and quickly got tired of it and went back to Normal Mode. So far as everyone else knew, I was a fun dad having a fun time. When I stopped trying to drive it like a car with any kind of performance, it was fine. If your only plan with this car is to look a suburban version of cool and you’ve got a small family and want AWD, it’ll work. I won’t judge you and many other people will give you a thumbs up.